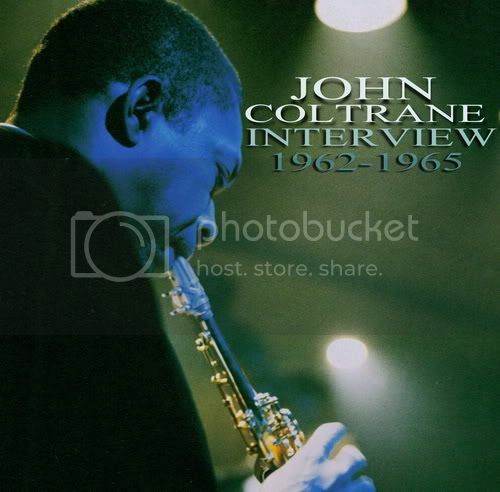 John Coltrane interview. USA 1958. 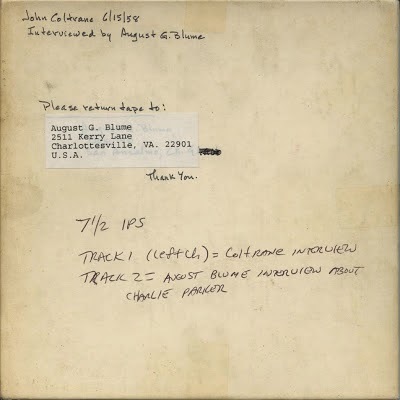 This previously unreleased full recording (from June 15, 1958) has been made available in conjunction with the Slought Foundation "Coltrane." initiative. An excerpted transcription, "An Interview with John Coltrane" by August Blume, was first published in The Jazz Review 2, no. 1 (January 1959): 25. Recorded at Blume's home in Baltimore, Maryland prior to that evening's performance of the Miles Davis Quintet (with John Coltrane, Red Garland, Paul Chambers, and Philly Joe Jones) at The Crystal Caverns, Washington, D.C. Opening November 15, 2003, Slought Foundation, Philadelphia will present a two-month exhibition and series of events revisiting the work of John Coltrane through archival material and contemporary art. Philadelphia's rich jazz heritage provides an ideal backdrop for this tribute, which includes archival material pertaining to Coltrane's life and artistic practice (e.g. original photographs, recordings, and posters), and work by conceptual artists that, since the 1960s, have executed homages to Coltrane's oeuvre. John Coltrane interview. Sweden 1960. "Thank you. And now I'd like to introduce the musicians of the next group, and it's a group I'm very proud to be presenting in their first appearance in Europe. Start off with the drummer, Jimmy Cobbs... On piano is Wynton Kelly... The bassist is Paul Chambers... On tenor saxophone, John Coltrane... And here he is, Miles Davis..."
John Coltrane interview. Japan 1966. On July 18th, 1966, John Coltrane arrived in Tokyo International Airport. With him was bassist Jimmy Garrison, tenor saxophonist Pharaoh Sanders, drummer Rashied Ali and pianist (and wife) Alice Coltrane. His reputation preceded him. Several thousand Japanese fans surrounded the plane shortly after touchdown, chanting and singing. Upon exiting, Garrison asked Coltrane if he knew if some ‘big shot’ was on the plane with them. It was then that they spotted the giant banner reading WELCOME JOHN COLTRANE QUINTET. In Japan, Coltrane sold around 30,000 copies of each of his recordings, equivalent to that of the United States, at that time a country with nearly twice the population. A red carpet awaited the musicians, and limousines; schoolgirls handed them bouquets of flowers. They were treated like royalty. The admiration for Coltrane’s music in both Japan and the United States and elsewhere is in part due to its religious or spiritual quality. Listeners had perceived this quality in Coltrane’s music since the early 1960’s; it was his 1964 recording A Love Supreme with its overt spiritual connotations that somehow validated this perception. 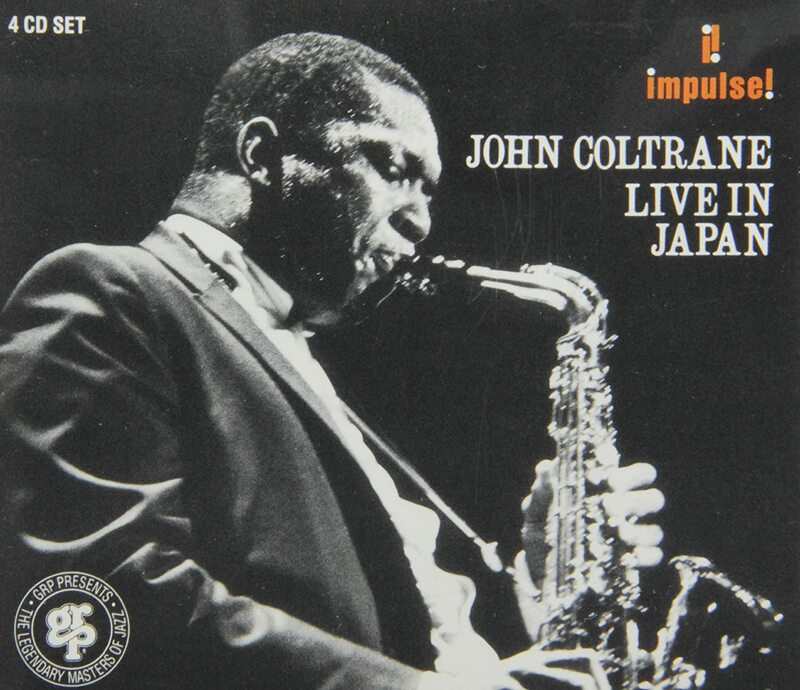 As one Japanese jazz musician observed, Coltrane’s "music is like a religious ceremony." The day after the arrival of the Quintet, Coltrane was ushered into a press conference where he was asked what he would like to be in ten years. Coltrane replied without hesitation, "a saint." This reply was, in part, a product of the era’s idealism, this being the year the Beatles discovered Indian sitar player Ravi Shankar, whom Coltrane had discovered five years prior through tenor saxophonist Yuseef Lateef. Coltrane was then deeply interested in Indian music’s emphasis on melody and rhythm, yet his interest in the East did not end with music; he was also reading Yogananda’s Autobiography of a Yogi (recommended by tenor saxophonist Sonny Rollins) and Krishnamurti's Commentaries on Living (recommended by pianist Bill Evans). Upon his arrival in Japan, Coltrane was well into what most critics and listeners came to regard, after the dust had settled, as a spiritual quest. Some say this quest had started two years earlier when he had a self-proclaimed "vision of God" during meditation, and heard a "universal music" which he then spent the rest of his fiercely determined career, beginning with A Love Supreme, trying to capture. One reason for this fierce determination to capture the music of his "divine vision" (which he was beginning to hear echoes of in Western, Eastern and African music) was possibly due to Coltrane’s impending mortality, illustrated in the photographs drummer Rashied Ali took of Coltrane while in Japan, and only discovered after Coltrane’s death of liver cancer the following year. Garrison: "About half of these pictures showed Trane holding his hand over his liver, like he was trying to stop the pain he must have been feeling all by himself." However, it can be argued that this period was rather a sudden speeding up of his spiritual journey begun long before in the small town of Hamlet, North Carolina, where Coltrane was born on September 23, 1926. 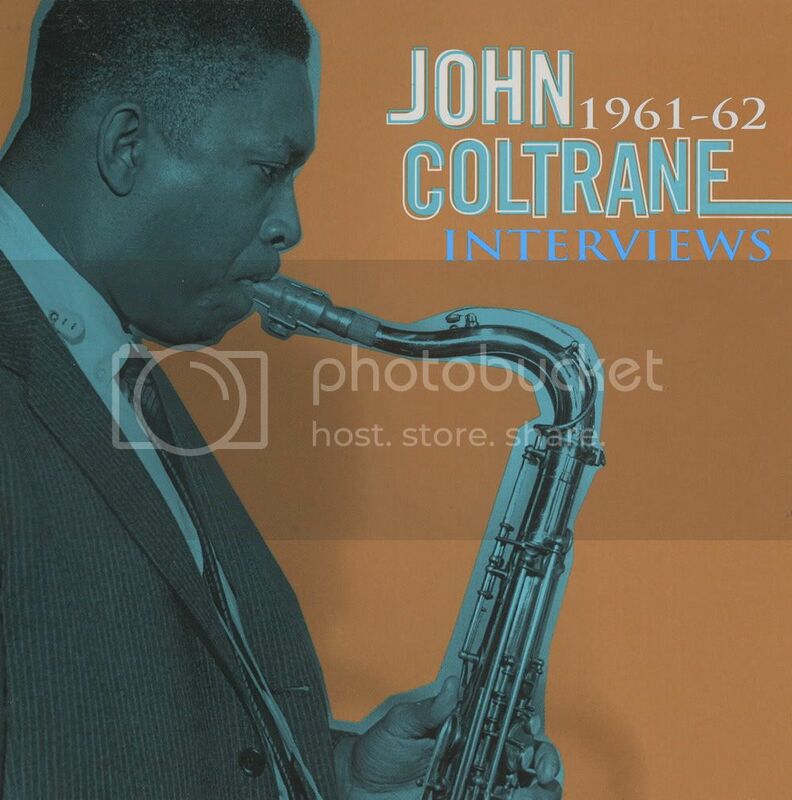 John Coltrane interview. USA 1966. One afternoon in November 1966, Frank Kofsky took the train out to Long Island. He was about to spend the day with John Coltrane. Kofsky brought his tape recorder and what we get to hear is the conversation the two men had as they drove through town and made a few stops along the way. Coltrane had moved to Huntington, New York with his wife Alice and their children in 1964. They lived in a modest house on a quiet, tree-lined street. It was a home to raise a family. Coltrane had just turned 40. He would die from liver cancer less than a year later. During this episode Coltrane talks about moving to the country, setting up to practice, connecting with the sound of an instrument, Malcolm X, music as means of expressing that state of society, and how he wanted to change the world. "I keep a horn on the piano and I have a horn in my bedroom." "Music, being expression of the human heart or the human being itself, does express just what is happening." "In any situation that we find in our lives, when there’s something we feel should be better, we must exert effort to try and make it better." Interviews with Michiel de Ruyter. 1961-1965. "After the final after the ovations which were abruptly broken off, a large part of the audience was completely silent (...) because it was enchanted by this music, and the spell was first developed touch was there to talk again. How this was achieved hypnosis? I do not know. Of course, one can analyze, technically, in retrospect, a fairly meaningless anyway hassle. But it is the task of the critic to the reader to make clear what was to hear jazz. (...) It is up to the task of the critic to qualify heard, to put into perspective, but the jazz of these Coltrane Quartet is elusive, just above the top of the pyramid. And yet, this music was the most beautiful music. I feel that I know. " It is a declaration of love De Ruyter to the music of Coltrane, the musician that he, after Ellington, was perhaps dearest. He was in fact the prototype of the great twentieth century artist who starts from the tradition, and it will then hold both ontworstelt. The iron consistency with which Coltrane put each new step, continued to follow the jazz historian De Ruyter well, while the unfolding adventure curious De Ruyter continued to speak. The fact that both Coltrane's career as De Ruyter's life work (Jazz History) were degraded by liver cancer, is deplorable. The fact that the radio series was stabbing at Coltrane, is a tragic irony. Some parts, mainly Ruyter's commentaries, are in Dutch.